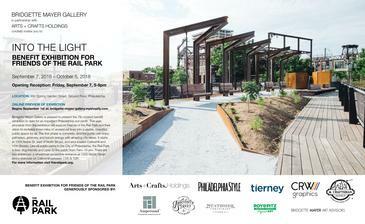 The Bridgette Mayer Gallery in partnership with exhibition space host, Arts + Crafts Holdings, is pleased to announce its 7th Benefit Exhibition supporting Friends of the Rail Park, a nonprofit organization that is transforming unused highline railway tracks into vibrant public spaces in Philadelphia. From September 7th to October 5th, the exhibition will be the largest yet in presenting paintings, photographs, collages, and mixed media from over 200 curated artists encompassing various styles and techniques. Artist’s works will be featured on either 10”x10” panels or 24”x24” panels. This benefit will help kick start Phase II of Friends of the Rail Park three-phase plan to renovate train tracks into green space spanning multiple neighborhoods of Philadelphia. Each work will be sold for $500 for 10” x 10” panels or $2,000 for 24” x 24” panels done by esteemed and renowned artists. Some of the artworks in the exhibition retail for 5000.00 to 20,000.00 and it is an opportunity for collectors and new art collectors to purchase original art at affordable prices. 25% of the proceeds will benefit The Rail Park.